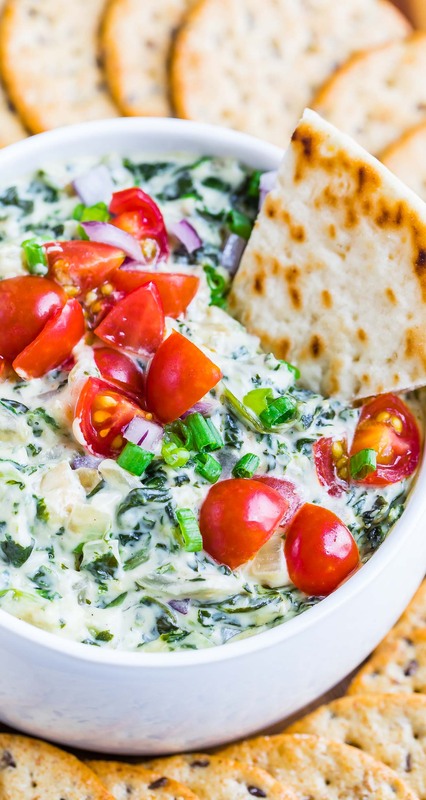 This healthy hot spinach artichoke dip is going to rock your world! Dive in with a few pita chips and a pile of crunchy veggies and be prepared to hover over the bowl until it’s gone! Around here we make a LOT of spinach dip. Come be my neighbor, I share! It’s one of those dishes that I insist on making differently nearly every single time I make it. Sometimes I’ll add mushrooms, other times I toss it in a cast iron skillet with some shrimp, sometimes I even serve it chilled. This one was intended to be frozen for when we have house guests to feed. A quick taste test turned into a impromptu photo shoot, which turned into a little extra sampling on my part, which then turned into an all out feeding frenzy with P and I attacking the bowl you see pictured and barely getting the rest of the dip into the freezer. To say I might be making it this exact way the next two or three dozen times I make spinach dip would be pretty darn likely. Now usually when you’re having a face-off with a bowl of spin-art dip, you can expect to be ingesting the usual suspects: cream cheese, mayo, sour cream, or heavy cream. In some instances you might be getting all four in one single recipe. Ho. Ly. Cow! Most also have a higher dairy-to-spinach ratio, making them a lot less healthy than the name suggests. Luckily we love our veggies here, and this particular recipe has a veggie-to-dairy ratio that’s fun and flavorful, without all the excess fat of a traditional dip. This recipe makes 5-6 heaping cups of spin-art amazingness. Scarf some now and freeze some for later, or serve it up at your next party or potluck! First defrost your spinach. You can use boiling water, the microwave, or leave it overnight in the fridge to thaw. For the frozen chopped spinach, you'll want to squeeze it dry with a handful of paper towels to remove the water from the spinach. For the creamed spinach, simply defrost or heat until bubbly. Chop your veggies, mince your garlic, and grate/measure your cheeses. Mix it all together and bake at 350F for 20 minutes or until hot and bubbly! You can add the red onion and tomato topping before baking for a hot topping or add afterwards for a refreshing crunch (I keep mine raw!) It makes a gorgeous garnish plus adds texture and added antioxidants. Um.. heck yes! All that's left to do is grab some crunchy tortilla chips and a plate full of veggies and dig in! Have a few spare minutes? Sauté 1 cup of chopped white or yellow onion in a teeny bit of olive or avocado oil, adding the minced garlic from the recipe above towards the end. They're totally scrumptious in this dip! Have fresh spinach handy? Add it in, yo! 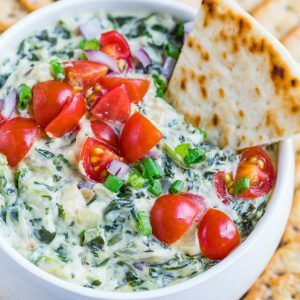 I've made this dip with a combo of fresh and frozen spinach before as well as fresh and creamed spinach. Grab what you have handy and get ready to faceplant! Recipe yields 5 cups of dip. 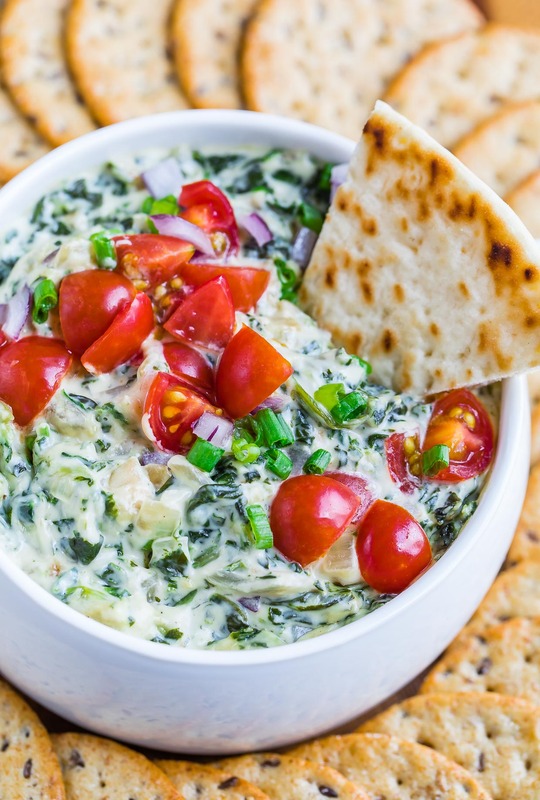 If you get a chance to try this Healthy Hot Spinach Artichoke Dip, let me know! Veggie-tastic. That’s a word. Google it. Oh fine… it isn’t a real word. But it is delicious! I highly suggest piling leftovers into an omelette the next morning. 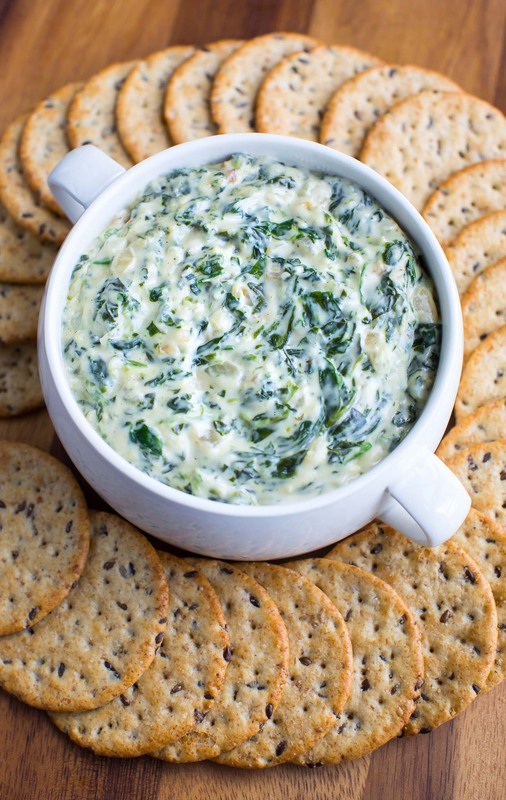 I’ve never made spinach dip, but this recipe with all the cheeses looks divine! Yum! this looks like a great recipe that I need to try. I love spinach dip! When I thaw my spinach it is always soggy and gross. Is there a trick to this or do I just need to get over it? The dip looks totally terrific and I love the amount of veggies in it. Oh this looks so good! All your dips make me wish I wash a dairy-free girl! Have you ever been to Houston’s? Their spinach artichoke dip is danger. I could eat it by the spoonful. And I have. yours is probably much safer… and it looks absolutely delicious! Girl you are only 2 hours away from me. I am *this* close to getting into my car, saying peace out to my boys, and heading to your house for this dip. WATCH OUT!!! my freezer is stocked with this stuff – do it! Wow – that sounds delish! & your pictures are amazing!! You really make the dish look beautiful!! haha thank you! It’s easy when veggies are *SO* pretty and colorful! Looks and sounds Delicious!! 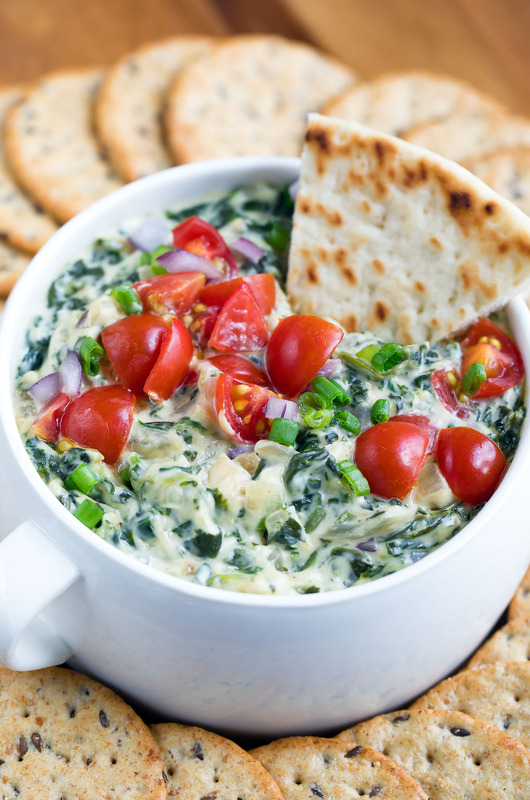 Love spinach and artichoke dip. This does sound healthified! !